Cornice: A decorative molded projection at the top of a wall, window or construction. 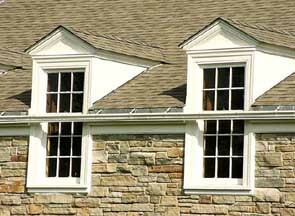 Dormer: A structure, projecting from a sloping roof usually housing a vertical window that is placed in a small gable. Albright Memorial Library, Scranton, Pa.